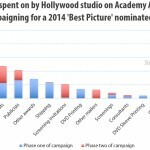 How much does a Hollywood Oscar campaign cost? 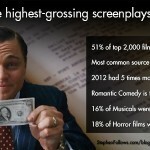 Where do highest-grossing screenplays come from? 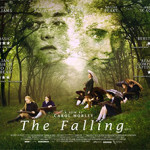 Do BFI-backed films make a profit? 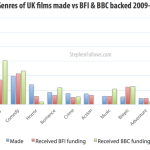 Which film genres are public organisations funding? How many people work on independent films in the UK? How many producers does it take to make a film? A few weeks ago I looked at how big each of the main departments are on a feature film. It was a very popular article and led to a bunch of questions from readers. Over the next few months, between other topics, I’ll see if I can address those questions. First up: producers. In 1994, there were an average of 5.8 producers credited per film. By 2013, that grew to 10. The number of executive producers has doubled since 1994. Warner and Disney films have more ‘executive producers’ than standard ‘producers’. Major independent films tend to have more executive producers than Hollywood films. The number of associate producer credits has barely changed in 20 years. Larger films don’t have more producers than smaller films. 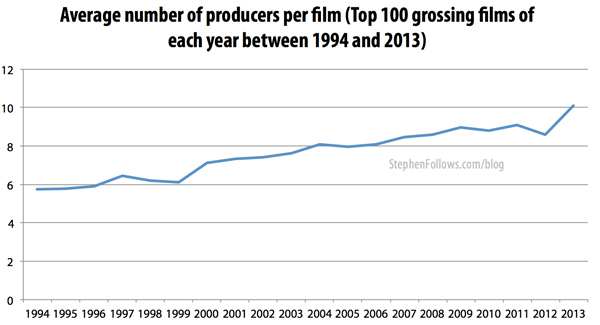 In 2013, the average film had 10.1 producers in total. That’s 3.2 producers, 4.4 executive producers, 1.2 co-producers, 0.8 associate producers and 0.5 other types of producer. This is almost double the number involved with films made in 1994 (5.8 per film). In the mid-to-late 1990s, there were an average of just under 2 executive producers per film. In 2000, the number jumped to 2.5 (more than the number of standard ‘producers’) and it has been rising ever since. In 2013, there were an average of 4.4 executive producers per film, compared with 3.2 standard ‘producers’. What is a Producer, anyhow? The exact title given to a producer is not regulated by any union or guild, unlike writers and directors in the States. The end result is a whole cavalcade of producing titles and no agreed standard. While some people may be credited as co-producer on one project, the same responsibilities might receive an associate producer credit on another. Each company or studio will have their own rules but they don’t seem to match up with each other. Executive Producer – A powerful person, normally related to the financing and/or the studio behind the project. Co-producer – Someone significantly involved in the making of the film. Also encompases a local producer when a film is a co-production between multiple companies and/or countries. Line Producer – The person planning the actual filming process. Associate Producer – What you give your secretary instead of a raise. Ok, ok, the last one is only half true. The ‘associate producer’ credit has been devalued over time and in many quarters it’s seen as a worthless credit given to those who you need to placate in order to make the movie. That ‘secretary’ joke comes from David Mamet’s glorious film ‘State and Main’ which follows a huge Hollywood production shooting in a small town. Interestingly, the data shows that the average number of associate producers per film has barely changed in 20 years (1994 = 0.9 per film, 2013 = 0.8 per film). Films at Warner Bros. and Walt Disney have more ‘executive producers’ than standard ‘producers’. Taking into account the questionable nature of ‘associate producer’ credits mentioned above, they are rarer on 20th Century Fox films than they are on Disney films. 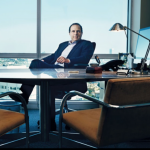 The independent sector, (defined as films made without backing from one of the six major studios), hires the most executive producers (on average 3.3 per film, compared with Hollywood’s average 2.6 per film). Do larger films have more producers? No. 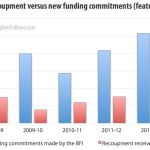 There isn’t a correlation between the size of the budget and the number of producers. Do more producers mean a bigger box office? No. But to be fair, nor does it appear that more producers are a hindrance. I cross-referenced the number of producers with the gross box office performance of the films and found no clear pattern. I also looked at the ‘budget to box office ratio’ to rate films based on how well they performed in relation to their budget, but still no pattern emerges. This is not surprising – clearly it’s the quality of producers that matters, not the quantity. How many producers is too many producers? In my article about department sizes on Hollywood films a few weeks ago (based on the top grossing 1,000 films 1994-2013) I listed the five productions with the largest number of producers. In my study, Lee Daniel’s The Butler has 39 producers credited to it – 5 producers, 17 executive producers, 6 co-executive producers, 4 co-producers and 7 associate producers. This data is based on publicly available information, such as Opus and IMDb and so there may be some reporting bias, especially towards the older films. How many producers does it take to screw in a lightbulb? Producers don’t screw in lightbulbs, they screw in hot tubs. Great post, as always! Informative, funny and bleak, all in one shot. Thank you very much!! 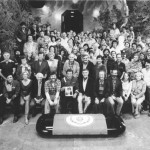 I thought I would be nice to have this informations of the Brazilian Film Industry too. I’ll try to see how to do it. But thanks for the insights and comedy of Producing films. Excellent. God only knows what they all really do. Is there any link between the number of producers and the return on investment to a film’s financial backers? I’m assuming that anyone who is a producer is getting paid and those costs would be expenses that decrease profits available to distribute to investors. Good question. The hard part of that question is working out how much the film actually returned to investors. The cinema box office is relatively well known but income from TV, DVD, Video on Demand are all private. Similarly, the overall budget level is normally known but other costs such as the hugely expensive task of global marketing is unknown. I did have a look for correlations between box office performance and number of producers but, unsurprisingly, I think it’s too slight a factor to move the income noticeably. The quality of the film massively overpowers the effect of greater or fewer producers.